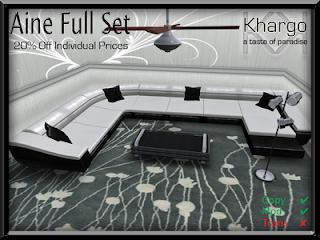 The Aine Sofa Set is a large, contemporary seating unit and accessories with seats for up to 7 avatars. The sofa has a texture change menu with over 60 textures, up to 6 different animations on the single seats and 10 animated cuddles on the couple spots. More pics can be found here at our photobucket. 5 lucky avatars in our subscriber group have won the Aine Sofa Full Set - watch out for the subscriber news to see if you won!